The Boden sale starts today! But for some of us who spend too much in Boden, it started a few days ago with a preview. Now I wasn't emailed about this - instead, I read about it on Dina's blog....clicked through to the Preview link, inserted my email address and it worked. Well I simply *had* to order a few things to try out.. So every year, I order Bistro Crops and every year I send them back. I love this pattern and they look good with a navy t-shirt but they just don't fit my lifestyle.. If I worked in an office, I'd definitely keep them. Size-wise, I ordered the 12L but the 12R would have been fine...these felt a little long on me...which is good for taller readers. Down to £29 in the sale. 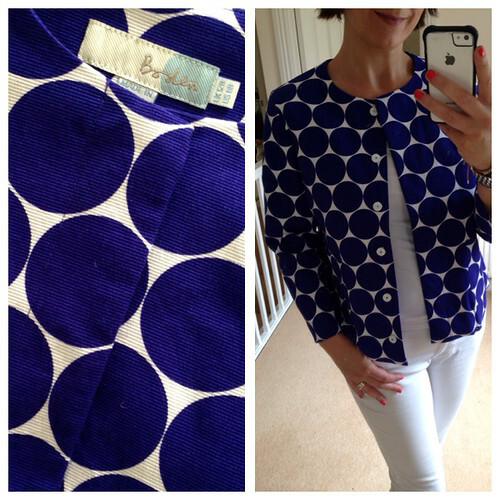 I featured the Marina Jacket on a recent blog post as I have admired it from afar for a few months now. It's also well reduced in the sale. Lightweight, modern shape and perfect for throwing on in this warmer weather but the pattern wasn't for me. I'm watching it in the other colour ways - though they're currently not as well reduced as the spotty pattern. I ordered a 12. Next up, the Beach Cover-up. Not sure why I bought this as I've not been on a proper beach holiday for about 6 years but I loved the pattern. It's a great buy at £24.50 if you need one of these for your holidays. There's a bit of stretch in it so it's easy to slip on and off. I ordered a 12 again. 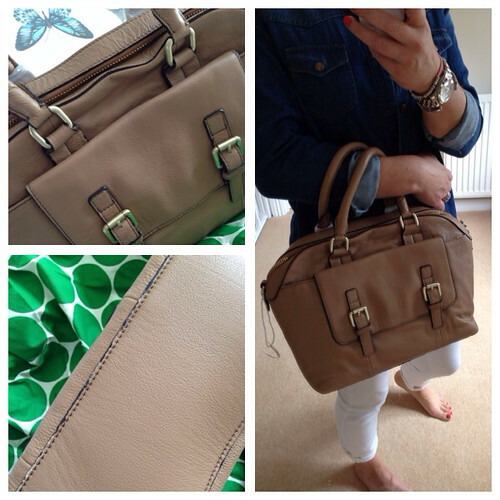 I had the highest hopes for this handbag as it looks stunning on the website and it's so well reduced. However, it was a disappointing buy and is going back. It's no-where near the quality of the leather I've bought from Boden before. It looks like a whole lot of off-cuts of leather all put together a bit shabbily. The worst bit about it was the finish around the edges - where there was a darker colour plastic showing...not sure how it got through the Boden buyers' quality control. Now I can't comment on the other colours - if anyone has this bag in another colour and has found the quality better, please do share. I read the reviews today and the comments are mixed. 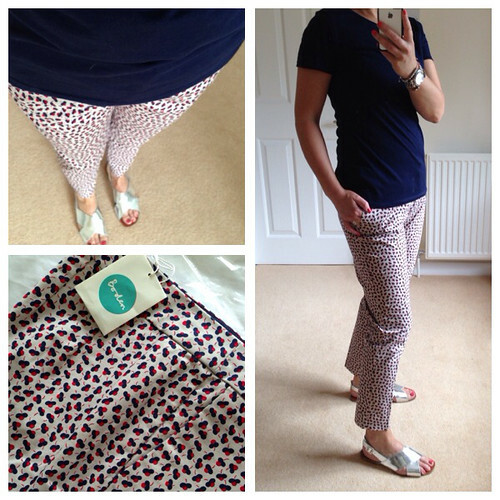 So it's all going back unfortunately....but it's always good fun getting a Boden box in the post and trying on. And it simply frees up some cash for other items. Do share if you've had more luck than me - what should I buy instead? I had the preview email too so had a browse in hospital - those bistros are the ones I am hoping to pick up b/c I wear so much navy! They look good even if you are sending them back. Gosh the bag is terrible quality - this is very unlike Boden. I love the beach cover up. See this is why I love blogs--you saw the preview sale on mine, and on yours I get to see some yummy goodies I hadn't even noticed before. Noted that these are here and will be putting them in my next Boden Review Roundup (Tuesday, hopefully). You look quite good in all. I think I would want to see you try another colorway of the Marina...it is beautiful on you! Hey. I have the bag in yellow and love it! Mine is soft, well stitched and I get lots of compliments. Wouldn't pay full price though, I used a voucher, credit and a discount code a few months ago. I'm waiting on my preview box, I have ordered the coral, even though I know I don't need two bags the same! Rest of the haul is mostly for my girls. Two dresses for me but at 38 weeks pregnant my judgment may not be quite right!! Hi Avril - just catching up with you - miss you on Blogger. 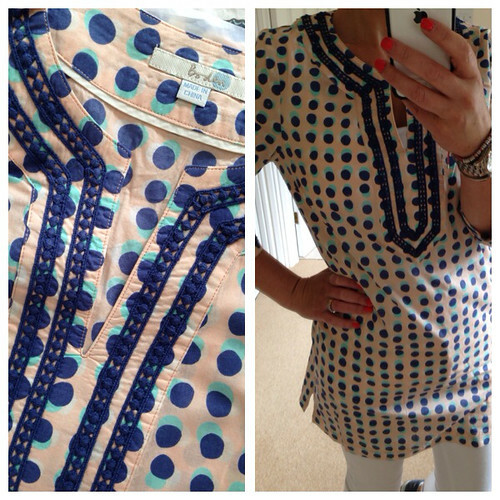 I love Boden clothes but had more luck than you this time. I managed to get one of their wrapover tops for £20 before the sale started and I really love it. Had to buy the 12 petite but it fits fine. Really good quality and I got the navy dotty print. But had to close the wrapover with a safely pin as it kept revealing my bra! I'm also very excited as I have been accepted to have a Boden party in October. The spotty jacket really suits you , but if you are unsure, then no point keeping it. Funnily enough I had looked at the bag on line, and was quite tempted, but I am really looking for a cross body one. Boden don't seem to have your particular one any more. The cover up is gorgeous and as others have said, not just for the beach. Enjoy trying on, and returning !! I had the preview email and couldn't resist getting the bag in yellow, still waiting for it to arrive and will be checking it now, but at half price I couldn't resist! I like you in the jacket! I ordered these trousers after seeing them on you. Hadn't really looked at that particular print before, but received them today and they are lovely! I know what you mean about them not fitting your lifestyle, but I work in an office and they will be perfect for work with a smart navy top. Love your blog, I get a lot of ideas from you!